Andrew Nurnberg is all smiles after selling Harper Lee’s To Kill a Mockingbird sequel Go Set a Watchman to more than 20 countries. While there have been a few grumbles about the difficulty of finding the International Rights Centre at the London Book Fair — which involves a walk past some remainder dealers that some may see as a warning, and then a lift up to the second-floor — once there, people are enjoying the natural light and the flow of visitors. Once again, the IRC has been cleverly themed by author, with clusters of tables marked Woolf or Chaucer. Even the café has been so designated, with the cake counter bearing a hanging sign saying ‘Mrs Dalloway’s Slice’. Max Brockman, CEO of New York’s Brockman Inc, said “China remains a constant bright point,” while for UK agent Andrew Nurnberg an extraordinary 18 months continues. As everyone knows, he is the agent for Harper Lee, something that mainly involved fairly standard renewing of contracts until a certain manuscript emerged last year. Now, with a Korean auction for Lee’s To Kill a Mockingbird ‘sequel’ Go Set a Watchman ongoing, and other foreign publishers still making the journey to London to read one of six photocopies of Lee’s original manuscript in the agent’s Farringdon offices, one of the most memorable periods of his life in the book business is continuing. “We have sold to more than 20 countries now and people are still coming. When I came back from a trip recently, there were two Turkish publishers in the office reading the manuscript. The manuscript is a photocopy of Nelle’s [Harper Lee’s nickname] original that she typed on an old Remington. 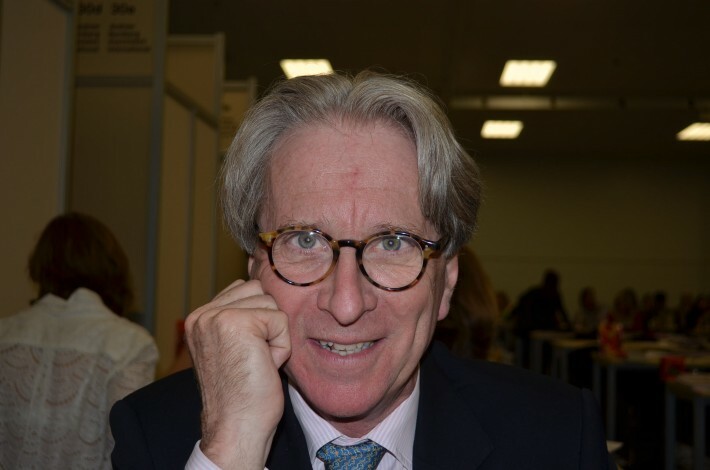 While at LBF he has enjoyed reminding HarperCollins’ CEO and President Brian Murray of the time last year he called him up and said he would be in New York and would like to drop by. “I was already seeing Michael Morrison [HarperCollins US Publisher] and I suggested that Brian might like to be there too. Neither had any idea why. I had been seeing Nelle in Monroeville and I had asked her if she would inscribe two hardbacks of Mockingbird for them. When I was in their office I said I have a present for you and I presented them with the hardbacks. They were thrilled – a dedicated Mockingbird is very special. Then I said ‘I have something else for you too’ and I took out the manuscript of Watchman and gave it to them. It is certainly going to be quite a summer — a global front-page news story, and a publication perfectly timed for all those Summer Reading promotions.